This is the book I’m reading over at “Chapter’d” and so far, it’s really good. As you can see, there are some elements from A Midsummer Night’s Dream here, which makes me a little concerned for Jack. No one should owe a debt to Robin Goodfellow. 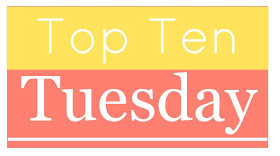 This week’s Top Ten Tuesday, hosted at “The Broke and the Bookish,” is a tricky theme for me, simply because I don’t read many scary books. I’ve never really been into the horror genre at all, although I have branched into it occasionally. I did do list like this last year and was only able to come up with five books. You can see that list here. Since I already gave you five books there (and I still maintain that they are excellent choices for this time of year), I will give you five more today. 1. The Tell-Tale Heart and Other Writings by Edgar Allen Poe – Really, you could pick anything by Poe, but this is a really good collection. No one tells twisted scary stories like Poe, The Tell-Tale Heart being one of my favorites. This is an author who really likes to mess with your mind. 2. The Inheritor by Marion Zimmer Bradley – This book is much less popular that Bradley’s The Mists of Avalon, and it’s also very different. A modern tale of music, witchcraft, power and possession, most people wouldn’t consider this a scary book, but it is very intense and definitely has some touches of horror to it. 3. Scar Night by Alan Campbell – This is the first book of a series that I really need to finish at some point. Full of angels, good and bad, set in a wonderfully precarious setting (a city that is suspended over a large pit by huge chains), this book is fascinatingly creepy. 4. The Shadow World series by Dianne Sylvan – Yes, this one will be on my list again. Sorry, I can’t help it! It’s so good! This is for people who like a little snark and sarcasm with their scary stories. Definitely more urban fantasy than horror, but these aren’t fluffly Twilight vampires. Their world is bloody and fraught with danger. Good stuff. 5. The Time Quartet by Madeline L’Engle – I’m adding this because, hey, not everyone wants their scary stories to be huge gore fests. These books are enchanting, technically children’s literature, but still enjoyable by adults. And yes, I think they can be very scary – I still remember not being able to sleep after finishing A Wrinkle in Time! So there is my continuation of good Halloween stories. Please leave your lists and teasers in comments! Previous Post I can has new phone! Edgar Allen Poe certainly does tell creepy stories! Great list. I know! I can’t believe I forgot him last year. Sounds like a good read. Here is mine and Mine . Oohh, love the teaser! Going straight on my TBR list! It is a little. I’m curious to see how far they’re going to go with it. Great list for your TTT. Thanks! Your list is really good as well! I love the characters’ names in your teaser! My Teaser today is from THE FUNERAL DRESS. It’s pretty good so far.